The 46th UAE National Day is just round the corner and residents are gearing up for the much-awaited amusement and festivities. Like every year, this day will be celebrated by spectacular fireworks across the country, flag-raising ceremonies and parades. But, the main attraction will be the magnificent fireworks that illuminate the UAE skies. The public sector in UAE will enjoy a four-day break on the occasion, while the private sector will get a three-day holiday, both starting this Thursday, November 30. The Global Village is the world's largest tourism, leisure, shopping and entertainment destination. Be prepared for special events and fireworks to mark the UAE National Day. On the occasion of the UAE National Day, Wafi Mall has lined up an exciting set of cultural and fun activities for the whole family to enjoy on December 1 and 2, 2017. A 'flag hunt' for children, and a special light and sound show are among the events the mall is organising. In the 'flag hunt' show, children will be given a booklet with names of stores, following which the participants will have to visit each store and secure a 'stamp'. Visit La Mer for an evening of fireworks and cultural activities on the eve of UAE National Day. The fireworks will start from 9.30 pm on December 1, 2017, with a series of specially created, themed graffiti canvases on display. There will also be live Arabic bands, cultural performances, and children's workshops from December 1- 3, 2017. Coffee and dates will be served to visitors throughout the long weekend. There's more than one chance to celebrate the UAE's 46th National Day at Dragon Mart 2, with nine days of events and entertainment. There'll be live music from traditional bands, as well as a heritage market where you'll find free Emirati food and drinks, handicrafts, and the chance to get a photo with a falcon. Visitors can enjoy live performances, some of them inspired by Dragon Mart, including a Kung Fu display and a Peking Opera show. 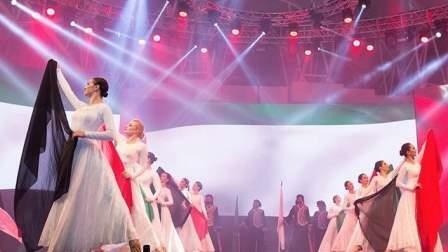 There'll also be entertainment for children, with kids' dance shows and kids singing the UAE national anthem. How could we miss out on this!